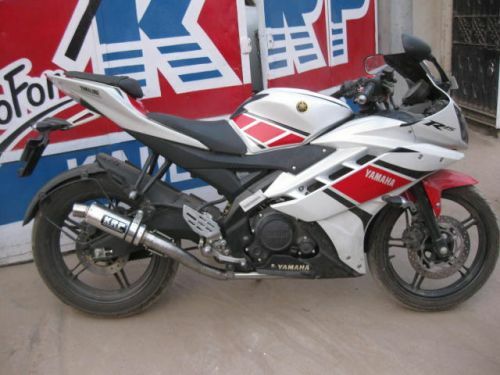 Yamaha R15 V1 / V2 KRP Exhaust Charger has been designed after regrious in-house Dyno Testing, Race & Road Testing.This is ready-to-fit Exhaust Charger and comes in two parts. The first one being the all Steel Bend Pipe for better strength, corrosion resistance & long lasting looks and the second part being the Aluminium & Stainless Steel Cannister.The cannister is held tightly with the bend pipe by stainless steel high strength springs. This Exhaust Charger comes with the cannister mounting bracket alongwith clamp & vibration damping pad. 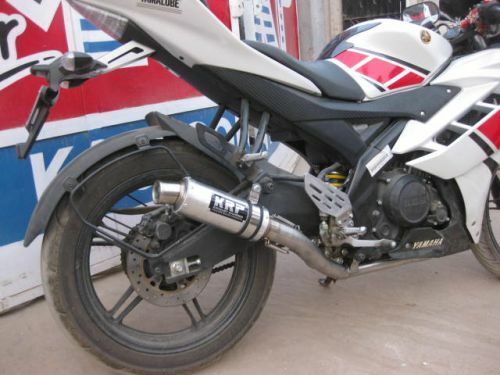 Yamaha FZ16 / FAZER KRP Exhaust Charger has been designed after Testing, Race & Road Testing.This is ready-to-fit Exhaust Charger and comes in two parts. The first one being the all Bend Pipe with proper strength, chrome plated to prevent corrosion to some limit & long lasting looks and the second part being the Aluminium & Stainless Steel Cannister.The cannister is held tightly with the bend pipe by stainless steel high strength springs. This Exhaust Charger comes with the cannister mounting bracket alongwith clamp & vibration damping pad.